I’ll be spending the summer in Munich, Germany, at the Rachel Carson Center for Environment and Society. They’ve given me a writing fellowship and I will be drafting All the Boats on the Ocean. The news about the fellowship came about the time I started to do some research on Rosefish in the Atlantic. Rosefish are found throughout both the Atlantic and Pacific oceans. They were decimated by factory processing ships during the 1960s, decades before scientists were able to establish how old fish in deep water could be. 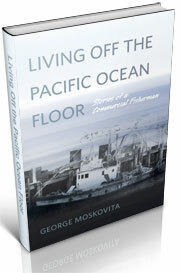 I’ve written about the development of the Pacific fishery, by people like Captain Gordon White and the Yaquina, fishing out of Newport. Would housewives buy ocean perch? 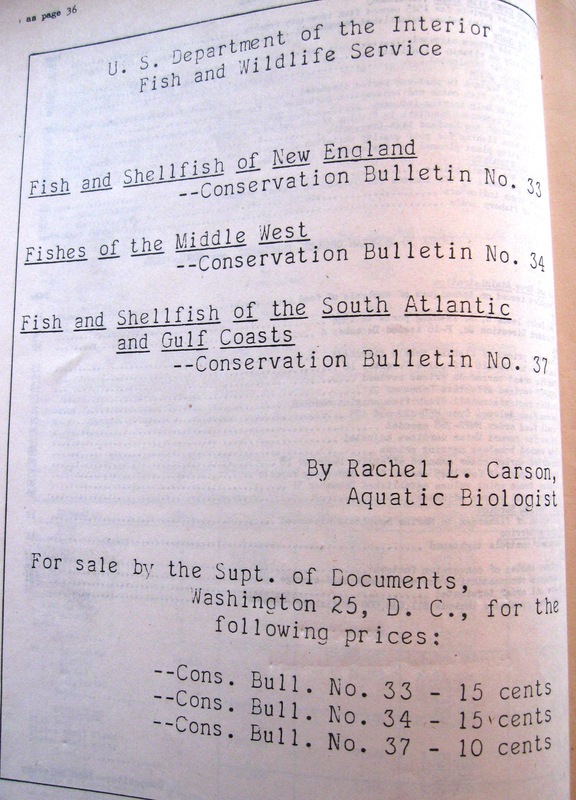 The Service assigned its most talented writer, Rachel Carson, to write a series of papers, geared for housewives, to tout the benefits of new stocks of fish. Conservation Bulletin, No. 33, called, “Food from the Sea,” was published in 1943. Three others followed. The U.S. Fish and Wildlife Service charged 15 cents for Carson’s pamphlets. Carson worked for the federal agency through the 1940s. To gather information for the Bulletins, she traveled throughout the East and South coasts, talking with scientists. How she must have enjoyed these talks! She also knew about the advances oceanographers were making during the war; she sat in on high-level conferences weighing the effects of ocean currents on military operations, according to Paul Brooks, a friend who wrote about her in 1972. She was in an ideal position to take in this new information and seek to synthesize it with her own extensive knowledge. 1941 139 million pounds (anticipated). Carson found working for the federal government was often tedious. It left her little time for her own writing. 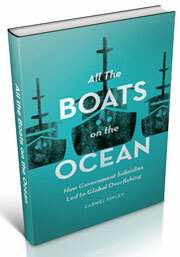 But writing about fish stocks for the four Bulletins certainly informed Carson’s understanding of the oceans, a vital step on her way to writing her 1951 best-seller, The Sea Around Us. And it kept her in contact with the agency’s biologists, including those involved in predator and pest control. Lear writes that Carson was sure to be informed of the research, because her friend, mentor, and former boss, Elmer Higgins was collaborating with Clarence Cottam on a series of research reports on the impact of DDT on fish and other wildlife. She also had to wait for wartime oceanography studies to be declassified. Silent Spring was published in 1962. The Rachel Carson Center for Environment and Society was established in 2009, funded by the German Federal Ministry of Education and Research. Its aim is to strengthen the connection between humans and the natural world, and to strengthen the connections between the humanities and science. I can’t think of a better omen for my summer than to have come across some of Carson’s scientific papers. And dipping back into Lear’s wonderful biography is also a cautionary tale, since Carson struggled financially for most of her life and found it difficult to find the time to write. She would have very much approved of a place that supports writers. And I think she would have been pleased that her words spoke to me across the decades, reminding me of her central message about the fragility of the ocean world and its occupants. 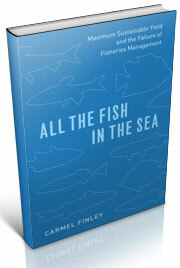 It’s not a message you get when you talk to fishery scientists or economists, with their multiple sets of numbers. But it’s really the most important message of all. Paul Brooks, The House of Life: Rachel Carson at Work. Boston: Houghton Mifflin Company, 1972, 109. Linda Lear, Rachel Carson: Witness for Nature. (New York: Henry Holt and Company, 1997), 108. Rachel Carson, Food From the Sea: Fish and Shellfish of New England, Conservation Bulletin 33, Department of the Interior, Fish and Wildlife Department, 47. This entry was posted in Carmel Finley, Environmental History, fisheries science, Fishing, History of Science, History of Technology, Pacific Fishing History Project, Rosefish, Sebastes rockfish and tagged Paul Brooks, Rachel Carson, Rachel Carson Center for Environment and Society, Rosies, Silent Spring. Bookmark the permalink.